New members are always welcome. We have no auditions and you don't have to be able to read music. What all our members share is an enthusiastic approach. The atmosphere at our rehearsals is a blend of friendliness and dedication. We meet on Sunday evenings between 7.30 and 9 pm in St Monans Parish Church Hall, Station Road, St Monans. The weekly subscription is £1 per member which includes a cup of tea or coffee. 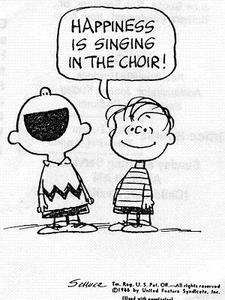 Although essentially a St Monans-based choir, membership is open to all in the area aged 16 and over. For more information please contact us here, or phone Ruth or Brian on 01333 730 741 or just turn up!